Yep, now eligible due to the oversized holders. I'm sure a bunch of new ones will show up this year. Those new oversized holders are nice but it looks like there is a lot of room for the pics to move around possibly damaging them? I think it's good that it is expanding, just as the definition of what is a card is doing. Remember when Cobb's 1907 postcards weren't considered his rookies? Nothing new there. Lots of swimming room in a lot of PSA holders. They don't move much from what I can tell. You can hit an edge and move it but they stay put for the most part. I just need to figure out how to store them. All of my other slabs are in binders but the Jumbo slab is 9-3/4"x13-1/4"...huge. And they don't stack well. I was wondering when they’d start using them for cards. I’m assuming you have the Rawlings premium and the sticker? If so, would love to see photos. I won’t be getting any of my larger stuff graded as the holders make it too hard to store. Like in your pic, I thought if the card could move around some, they would utilize a plastic bag/sleeve? Last edited by sflayank; 01-05-2019 at 03:20 PM. What about the 7 (nice number, ) J.D. McCarthy postcards and the 8 x 10 J.D. McCarthy photo? The 1954 Sports Illustrated Topps "Card;"
Also, the 9 x 12 Dormand if it's not too big. Lastly, the one I'd like to see get on the list the most is Mantle's 1951 self-promotion card. I wonder if they will do the same with the Clemente Master set? I checked and it doesn't appear so at this time. There certainly aren't many of the Clemente Rawlings premiums out there. I will have to try sending mine in - if I remember correctly I think there might be 2 different ones - 1 B&W and 1 color! They only add in the cards that they've graded and someone requests to be part of the set. PSA doesn't go out looking for cards to add to registry sets. That's all introduced by the collectors. Doubt PSA will ever grade since tough to pinpoint printed dates & they kept printing into the 70's right? I can confirm PSA is not slabbing the HI photos. They said not enough catalog info. There are also the 3 different brochures that are cataloged - they might actually slab those since they are 8.5x11 folded. Isn’t it larger than 8.5x11? It’s cataloged so will probably be slabbed at some point. Probably won’t since almost an ad. Think this will be slabbed in Jumbo. Scarce but if sent in they would slab imo. Already slabbed and red section…at least in Mantle Super set. Think these will be slabbed in Jumbo. Think they would slab this scarce one if sent in. Equitable sports 8x11, Manny's 8x10, complete Box w/mantle, 5 additional picture pack & action pictures, Topps plaque - Maybe too thick? Last edited by sflayank; 01-08-2019 at 07:32 AM. I believe the Hospital Postcard is in red in the super set because the example I requested that they add only graded authentic (they thought it was miscut but I’m fairly certain it was trimmed down). I haven’t requested that they add it to the Master Set yet but will at some point. Mike, if you want to trade your Rawlings for it, let me know! There are so many items that aren’t in yet that should be, but it’s such a frustrating process trying to get stuff added that I won’t bother anymore. Agreed re the Armour coins. The 1970 clinic card post dates his career though and probably is better suited for the super set. Last edited by Bestdj777; 01-08-2019 at 08:55 AM. Thanks for all the replies regarding the Mantles not on the "Master" list. I should mention that I don't participate in the registry, but I just thought since it is a "Master" list, it should include everything that we know of. It even includes items that were not meant to be cut from a box, e.g., the little photo on the top flap of the Transogram box. But yet, items that we've mentioned are not included? Yes, they were printed for a long time. But, the Exhibit postcards were printed for a while. Doesn't PSA list the date as 1947-1966 on Exhibit post cards? The sugar was kind of tongue in check, but also pointing out the inconsistency of PSA. The packet of sugar I have is not all that thick and might fit in a holder. But even if it doesn't, couldn't a person remove the sugar and have it graded? PSA encourages the destruction (yeah, an over exaggeration) of match books by having all the matches removed so they can be slabbed. The Wonderbread photo is 5x7. Isn't that PSA's job - to distinguish between the real deal and reprints/forgeries? The Bat Master photo was a premium found inside the Bat Master product and is no more an ad than the HI premium postcard. Also, isn't the Bobbin' Head photo actually listed as an ad photo? These are probably not much different than the HI coasters. There are two sizes of these. What is the maximum size PSA will slab? One is 8x10 which I gather they would slab. The other is listed as 8-1/2x10-1/2, but the one I have is 8x10-1/2 with no sign of trimming, which I assume would be too large? Also, yes to the Mascot dog food, adding the colors to the Armour coins, Mannyland photo, etc. "rawlings 69 yes however in red...post career card"
As are everything issued in '69 including Topps cards. Chris, if I had an extra Rawlings card, I would definitely trade with you. But I don't. However, I do have an extra '65 Yankees photo set with Mantle. I'd gladly trade you the entire set for just the Mantle hospital postcard. Lastly, "68 picture pack photo". What is this and who issued it? I hadn't heard of this photo pack before. Last edited by sflayank; 01-08-2019 at 11:58 AM. JUMBO can slab anything up to 8.5x11 so both are fair game imo. see link - i'm guessing he meant these? Light brown/brown and Yellow/brown Yoo-Hoo...the card stock is even different. As Keyman points out, those were issued in 1966. They were given out during a home game. They must have also been sold in concession stands. They can be found with either Houk or Keane (I've seen Keane much less often, probably because he was fired early in the year). By the way, very nice HI matchbook collection! (insert envious emoji here). Again, nice matchbook collection! I passed on a light brown matchbook a while ago because I didn't know they existed. I thought it must be a faded yellow matchbook. If you ever want to get rid of any, let me know. I might be able to find a good home for them. Larry, did you keep any pictures of the set that you could post? Besides Mantles, I collect Yankee photo sets/packs etc. I've not heard of that set yet. I've attached a picture of an advertisement in a 1966 Yankee program for the 1966 set. Last edited by sflayank; 01-08-2019 at 04:08 PM. You would think that with all of the empahsis PSA puts on other things, they could design a consistent holder where this does not happen - at least for run-of-the-mill, standard issue and size baseball cards. I’m loving the matchbook hoarde! I personally think it is a little excessive and that he should share with his fellow Mantle collecting buddies Who needs that many matchbooks?!? I've heard Ben doesn't even smoke! Nicely done. Glad you didn't destroy it in the process. It's nice that it comes apart like that. Whoa, that's a lot of wine you had to drink to calm your fears of destroying the matchbook and steady your hands to be able to do such a great job. Haha... yea the guy I took the staple out for owns an Italian restaurant so I’m sure the wine corks are plentiful his pic. Very nice. What else do you have there if you don’t mind me asking? BOTH versions of ALL the 1955 Exhibit postcard backs should be recognized. The SCD Standard Catalog notes both backs, the plain line or the line with the words A MUTOSCOPE CARD in it. 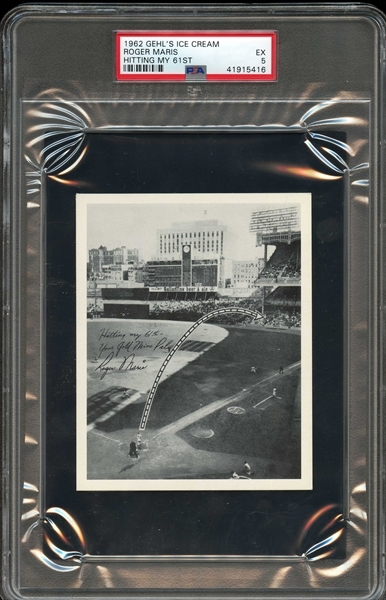 SGC has graded and noted for me my Jackie Robinson as a Mutoscope back. PSA should do this too. Thanks Chris. Manny’s, the 2 Requena’s, equitable, Gardner, another Rawlings... It will be interesting to see what they end up including. I noticed they changed the flip, in the span of two weeks, for the Rawlings staff from 1950-1970 to 1950’s-1970’s. Maybe they won’t include those in the Master since the dates go past Mick’s playing career. PSA told me with the Holiday Inn Mantle 8x10 that they would grade it if there was more published data. If Kelly would have shown pics in his SCD article no doubt they would have. That's funny. I thought it did include pictures. Had to go back and check and sure enough, my memory conjured up something that wasn't there. Ben, did you tell them the picture on the right was from a 1954 All-Star photo set or did they automatically put that on? I ask because that is the same photo used in a Yankee photo set that I think is from 1956. It could very well be used in Yankee photo sets from other years as well. I thought PSA kept the flips for crossovers to send back to the other grading companies but i guess the onus is on the collector now. And PSA is slabbing large full boxes now so 64 Meadowgold is fair game. They allow the flaps to be folded in...why they are now grading full Hostess boxes.